'I Was There': Mark Binning We left Terendak late evening on the 28th and bussed to Singapore through the night. I recall quite clearly leaving from the Company HQ with the rest of the company there to see us off. We then flew by RNZAF Bristol Freighter to Saigon (Ton Son Nhut). I recall we were late getting away from Changi because there were some problems with the plane that required attention, so we probably landed in Saigon later than expected. I believe that caused problems getting an RAAF Caribou flight to Nui Dat and we eventually (mid afternoon) flew to Nui Dat by USAF Hercules. 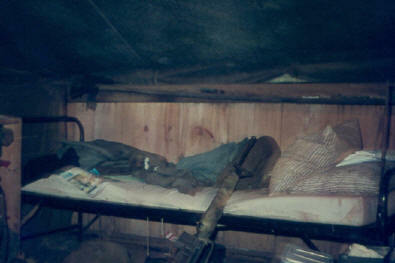 On arrival Keith Henson and I went straight to our respective Spt Coy platoons until the main body arrival on the 14th. I had a couple of days familiarisation in Nui Dat then went to FSB Discovery to meet Capt Jim Moran the mortar platoon commander and observe operations before coming back a couple of days before the main-body arrival. Other Movements. Finally five personnel were posted to SVN but not as part of the advance or pre-main parties - the last four are in the pre-deployment photo taken sometime before 28 October 1969. It is also known that Pte CHK Kennedy's name on the main-body flight roll was a mistake. Kennedy was held back in Singapore on a disciplinary matter [resulting in detention] just before W3 Coy departed and was later posted to V4 Coy for the remainder on their tour, rejoining W3 in May 1970. 'I was There': Maj Torrance I have a RNZIR Component Roll dated 25 Feb 70 that gives all the arrival dates in theatre for our folk. The three lists on this page are pretty accurate but there are a few changes. On the advance party list Sgt's Gorman and Heywood are shown as having arrived 28 Oct and Perawiti and Ryan on 5 Nov. Contrary to your pre-main list Makowharemahihi doesn't rate a mention on the Component list, or on a W3 nominal roll dated 1 Mar 70 so I assume he arrived later. From the third list Broughton arrived much earlier on 16 Jul 69 [likely posted as driver to NZ Component until he joined W3], Campbell and Moana on 15 Nov 69, Rangiwai on 26 Nov 69, and Carmichael on 29 Dec 69. At the link is the HQ 1RNZIR Administration Order for the ‘Movement to South Vietnam - W3 Coy Main Body’ signed by Captain Tony Birks on behalf of the CO Lt Col John Brook. Issued on 31 October 1969 the order has five pages, a distribution page and four pages of clothing and equipment lists – it promises to issue at a later date the actual movement details once these had been decided by OC W3 Coy. The website copy of the movement order was the personal copy of Maj Torrance and has the occasional amendment made by him. The Order advised the intention to move W3 Coy to South Vietnam on 14 Nov 69 utilising two RNZAF C-130 flights by the same aircraft. It is unlikely to be 'original', the format and detail would have evolved from the successful deployment of earlier Company's so a simple change of dates and names each time would have mainly been all that was required [having a document that worked successfully makes it easy for later staff officers to keep getting it right]. 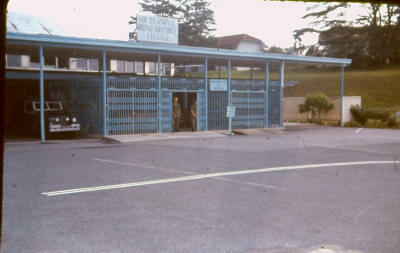 The Order is written against the background of 1RNZIR’s own separate move to Punjab Lines Nee Soon in Singapore in December 1969, meaning W3 personnel would not return to Wellington Lines Terendak Garrison and the 1RNZIR move needed to include the management of W3 base kits, the movement of W3 single personnel civilian cars to storage in Singapore, and the handover of housing by families left behind. Anyone care to comment on how the cars were really looked after..? The order allowed for weight of stores per person to be 250 lbs per soldier – this was based on the RNZAF assumption that the actual soldier would physically weigh 180 lbs so each individual was allowed 70 lbs of kit including weapon and webbing on the flight. The order issues ‘security’ instructions requiring 28 Bde patches to be removed from clothing, and for command of the Company to pass to HQ NZ Army Force Far East [FE] for the 24-hour period covering the movement to Singapore and on to Vietnam, playing out the political ‘game’ that the Malaysian and Singapore governments, and 28 Commonwealth Brigade, were not supporting the training and despatch of New Zealand troops for South Vietnam. While the postal address for W3 on arrival in South Vietnam changed to C/- HQ NZ V Force, GPO Auckland New Zealand, families remaining in Singapore had a different address that utilised the weekly RNZAF SATS flight from Changi. At this link are the two flight nominal rolls for the movement of the W3 main body from Changi to Vung Tau on 14 November 1969. The initial flight started on time at 0700 hours local but the aircraft experienced bird strike while still on the runway and a 3-hour delay was experienced while RNZAF engineers checked the aircraft. The flight finally left Changi at 1000 hours. This delayed the turnaround for the second flight which should have left at 1300 hours but which arrived at Vung Tau much later in the afternoon. One recollection is that the draft arrived at Nui Dat after last light – this true anyone..? The 0700 flight had 47 passengers including one destined for ARU [Aust Reinforcement Unit – a pool of supposed in-country reinforcements] but Ian Caldwell might like to comment if he actually served in ARU before joining 1Pl. The 1300 flight had 70 passengers including two for ARU and three for NZ Component. Again, Fred King might like to comment if he actually served with NZ Component before joining W3 Coy HQ. The records are probably the draft nominal rolls only, not the RNZAF form 1256 for personnel required by the RNZAF Flight Movements staff and the responsibility of the 1RNZIR Movement Officer. The earlier movement order required OC W3 Coy to decide on the composition of all flights and to pass draft flight rolls to the Movement Officer 72-hours prior to flight date. The RNZAF form 1256 for personnel [if found] is the authoritative record of who travelled when. This link is to the B Coy Nominal Roll as at 1 Oct 69. This roll is likely to have been the OC’s planning document for who would board which flight but comments and amendments are in Capt Jim Brown’s or Cpl Ted Mason’s handwriting. Were 1RNZIR short of paper..? The roll was printed by 1RNZIR in Terendak but on the back of old French maps of Vietnam – an example is shown on the last page of the roll. At this link is the administration programme published by the W3 advance party - although unsigned it was the work of Capt Jim Brown MC no doubt with assistance from W2 Coy HQ and Bn HQ 2RAR. The programme was required to fit around the departure of W2 Coy on the same day that the main body arrived, [the first W2 flight out using the incoming aircraft carrying the first W3 contingent in e tc], explaining why the W3 people were being directed to move into the W Coy accommodation from 0800 hours 14 November despite having been in-country for a fortnight. The programme anticipated the arrival of the first contingent at 1100 hours, but given the problem with the aircraft while taking off from Changi it is likely the actual arrival time was three hours later around 1400 hours and the 2nd flight arrival at Nui Dat much later than 1730 hours. It is apparent that W3 advance party echelon people did not replace W2 people until 14 November [the day W2 departed] although they would have been working alongside them for some days [cooks, canteen manager, clerk]. The 2RAR commanders Diary records that it was not until 15 Nov that W2 Coy was to depart Nui Dat to be relieved by W3 Coy, possibly a reflection of the sub-unit operational training programme dates rather than flight planning. Bedding. Bedding issued on 14 November to incoming W3 personnel would have likely been the same bedding handed in by departing W2 people the same day. The bedding was a foam mattress, foam pillow, clean green sheet and pillowcase, mosquito net, and a thin Australian tropical blanket. Ammo. Each flight on arrival at Vung Tau was given the ammo taken to the airport by W2 people, generally a magazine of 20 rounds per rifleman and a belt of 200 rounds per M60 machine gun. On arrival in the Nui Dat lines the advance party had stacked rations and ammunition in platoon lines and these were distributed to match operational scales on 15 November. This was the first time most personnel felt the weight of the full operational ammunition requirement, and many wondered at their ability to carry the full load – over time this was sorted out by either conditioning, reshuffles of people within sections, or by adjusting the requirement. Rations. The issue of rations on the programme is surprising as there would have been no requirement for pack rations for the initial period in base given the Company cookhouse was offering fresh food, but there might have been a requirement [SOP] to always have a minimal amount of food in the webbing for emergencies. The rations would have been a mixture of Australian 24-hour packs and US C ration meal boxes, both unfamiliar to the new arrivals so some experimentation would also have been encouraged. 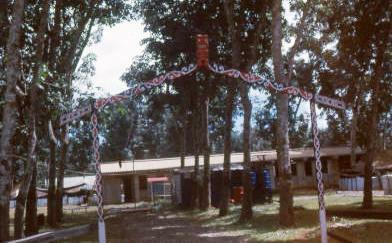 The W3 tent lines were not located against the Nui Dat base outer wire so there was no requirement to man sentries on the first night in-country. Issue of specialist equipment from the CQMS store [controlled and class A stores were programmed for the evening 15 November – perhaps due to a heavy workload in the company store during the day]. Documentation and familiarisation of the 6RAR/NZ (ANZAC) area - basically the platoons did a squad run around the sprawling 1ATF base to identify amenities, aircraft staging points, unit boundaries, no-go areas, etc. 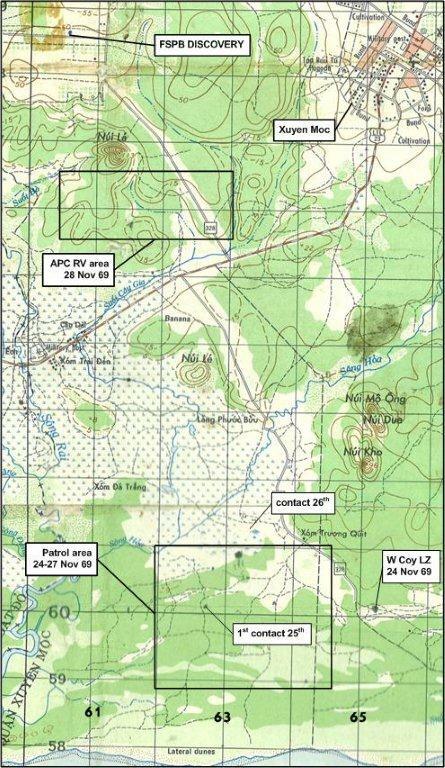 This is the W3 Coy Operational Training Programme issued 4 Nov 69 by HQ 2RAR to allow preparation by instructing subunits for the period until the Company deployed on its first operation away from Nui Dat on the morning of 24 November 1969, confirming recollections of a series of lectures by unit instructors or supporting arms on VC mine methods, ‘know your enemy’, and equipment and Supporting Arms familiarisation, including time out of base overnight with either APC or doing overnight TAOR patrols to the east of the base [the Op Order date is probably 19 Nov 69]. The weather during this period was on occasions wet but the wet season passed by the time W3 deployed on operations. The war diaries vary greatly in the amount and level of detailed information they contain. Their quality reflects the dedication and interest of those in charge of compiling them. There will be errors in the narrative, due to either difficulties experienced at the time of recording, or transcription errors when the detail is later typed into a consolidated record. W3 Operational Work Up at Nui Dat. Maj Torrance had his first company O Gp in-country at 1930H 14 November, and CO 6RAR/NZ (ANZAC) Lt Col David Butler RAR was programmed to address the Company at 1430H 15 November. 6RAR as a unit were absent from the base on operations, with V4 Coy at the Horseshoe and the Australian companies on Operation ROSS based around FSPB DISCOVERY in AO GULLIVER to the east of Nui Dat near the coast. On the day W3 arrived in theatre, 14 Nov 69, D Coy air assaulted into a LZ at YS583728 at 0800H. Pte ‘Stretch’ Bermingham W2 who was WIA at DAT DO on 12 Aug 69 in a mine incident DOW in Concord Repatriation Hosp SYDNEY, news reaching 6RAR 21 Nov 69 - this was a similar scenario to what occurred to Dave Wright W3 in January and March 1970. W Coy spent the day and night with a troop of APC at YS417692 on a training operation as part of the company work up programme. A future intention was announced for W Coy to air assault into AREA B of AO LINTON on 24 Nov.
W Coy prepared for and conducted an air assault and extraction rehearsal [airlift times were from 1330 – 1500H] with 9Sqn RAAF helicopters. OC A and W Coy received verbal orders from CO 6RAR at 1100H, followed by a helicopter visual recon at 1215H. Maj Torrance is directed that W Coy is to move to FSPB DISCOVERY and from there air assault a LZ at YS652601 commencing 241025H, expected to be complete on the ground at 1050H. The Company was then to search the area of padi fields south of XUYEN MOC. The Coy remained at Nui Dat doing final preparations and orders for the move on 24 November. It was soon obvious that while expected to pull their weight W3 Coy was being offered a shakedown period under operational conditions. Some soldiers grizzled about being sent on a 'sideshow' but with hindsight the opportunity to practise flat country navigation, to carry the operational weights and to adjust to the climate in a 'quiet' area was a good leadership decision. A sobering reminder of what the company might soon face happened as W3 Coy were about to leave Nui Dat on their first operation. A V4 Coy patrol [2Sect 2Pl] operating from their base at the Horseshoe at 0705H suffered casualties from a VC command detonated mine [three VC were seen leaving the area]: Spr Joe Barret was killed [KIA], Pte Peter Rauhihi was wounded but DOW at 1AFH Vung Tau at 1325H, and LCpl RC Davidson, Pte PR Smith, the patrol interpreter Sgt Tung, and two ARVN soldiers were also wounded. A and W Coy arrived at FSPB DISCOVERY YS605685 to the west of XUYEN MOC and near route 328 at 1020H, having travelled there by truck [TCV] in convoy with A Coy and escorted by a section of APC [3-APC]. About 1025 hours W Coy were airlifted into a LZ at YS652601 7-kilometres south of XUYEN MOC and 2-kilometres from the coast, being complete on the ground at 1107H. The LZ was an area of overgrown padi fields at the end of the old disused Route 328. Once secure on the ground the coy separated into three groups [2Pl remaining with Coy HQ] and started patrolling to the west and SW, basically patrolling for 3-days in an area of 3Km by 2Km before moving north 5-6Km to be extracted by APC to FSPB DISCOVERY. By nightfall 24 Nov 69 the separate elements were at these locations: HQ and 2Pl YS637701 [this LOCSTAT in the diary is probably a typo and should read YS637601], 1Pl YS633606, 3Pl YS641590. Map scale: each side of a map square is 1000 metres; squares are sequentially numbered left to right and then bottom to top and are further divided by 10 to give 6-figure references. At 1200H at YS628607 1Pl located 2x bunkers and 1x hut, recovered 1pr black sandals, 1x pr OG trousers, a quantity of sandbags, 1x raincoat, 1x M16 lifting device, 1x US M69 HE grenade and 12x fuses. Contact: 1406H at YS627601 while 2Pl were at halt with Coy HQ preparing an ambush, the diary records "contact 1x VC nil result. 1x pack captured, docs ID VC as Vo Van Mai, later thought to be Tu Mai, production team leader of PHOUC BAU village". This brief contact started when the lone VC walked unawares into the sentry position, the sentry operated the claymore switch but the claymore failed to detonate enabling the VC to quickly bolt but dropping a satchel containing a quantity of money and documents. W Coy night locations: HQ and 2Pl remained at YS627601, 1Pl YS621605, 3Pl YS627594. At 1500H at YS632607 W Coy [2Pl/Coy HQ] located a cache in a hollow tree, 2x boxes SAA, fishing gear and small med kit were recovered. Contact: 1630H at YS632613 W Coy [2Pl/Coy HQ] engaged 3-4 VC with arty and SA with unknown result. From the map it appears Coy HQ/2Pl observed the VC party north of their position and probably in an area of disused padi. W Coy night locations were: HQ and 2Pl YS633609, 1Pl YS625606, 3Pl YS627603. During the day the detached platoons patrolled into a company RV near the location of Coy HQ's previous night location, all night locations then being generalised as YS632609. A future intention was announced for 6RAR/NZ (ANZAC) to conclude Op ROSS on 1 Dec 69 and deploy to AO GULLIVER some distance north of AO GULLIVER as part of a new operation called Op MARSDEN - W Coy being warned to fly from FSPB DISCOVERY to secure the area of the new FSPB PICTON. The Coy turned north to continue the padi search, 3Pl having swapped the Coy HQ protection task with 2Pl. Night locations were recorded as HQ and 3PL YS615658, 1Pl YS615666, 2Pl YS605660, these locstats show the Coy slogged north over 5Km from the previous night location at YS632609, crossing a large open area of padi and stopping north of Route 23 near the junction of Route 23 and Route 328. During the morning the platoons likely RV'd with Coy HQ in the vicinity of YS615666. Early afternoon a troop of APC arrived to move the Company to FSPB DISCOVERY arriving at 1442H [probably moving along the axis of Route 328 but there is no record of this move in the 3Cav unit diary]. W3 Coy night location was FSPB DISCOVERY. W3 coy remained in the vicinity of FSPB DISCOVERY while preparing for the air insertion task on 1 Dec 69.